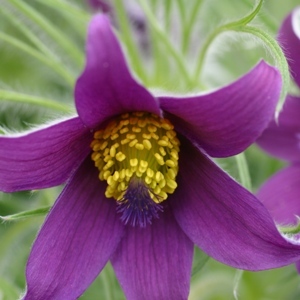 This plant is said to flower on Good Friday and is known as the pasque flower, which is French for Easter. An alpine plant that its indicative of grassland at least a century old in Great Britain. Deep or pale purple bell shaped, nodding flowers with silky dissected leaves and fluffy seed heads that appear after flowering. This sensuous downy plant just begs to be stroked. It’s clump forming, around 20cm tall, prefers well drained soil and being in full sun. Grown to best effect towards the edge of a raised bed in alpine planting scheme or rock garden. It does not enjoy root disturbance so once planted leave it alone and it will happily self seed.